Arlington, Va. - September 18, 2014 - PBS Distribution announced today it is releasing Cook's Country: Season 7 on DVD. "Cook's Country" (from America's Test Kitchen), with host Christopher Kimball, features the best regional home cooking in the country and relies on the same practical, no-nonsense food approach that has made Cook's Country magazine so successful. Filmed in a renovated 1806 farmhouse, "Cook's Country" is where family-friendly recipes are scientifically reimagined for the modern home cook. Cook's Country: Season 7 will be available on DVD October 28, 2014. The DVD run time is approximately 390 minutes on two discs and its SRP is $29.99. This set contains all 13 episodes from season 7, and 26 printable recipes. In Season 7, Cook's Country uncovers blue-ribbon regional specialties from across the country (Memphis-style wet ribs, Oklahoma fried onion burgers, and Texas potato salad) and tackles classic American fare in need of a makeover (quicker cinnamon buns, creamy cheese grits, strawberry pretzel salad, and more). Jack Bishop continues to challenge Chris Kimball to live tastings of kitchen staples such as frozen French fries, pepper jack cheese, and egg noodles, while Adam Ried reveals the test kitchen's top choices for equipment including cookie sheets, salad spinners, aprons, and more. "Cook's Country" also features short documentary segments on the history of American food. Favorites explored include Italian cream cake, pork pernil, summer berry pudding, and Natchitoches meat pies. 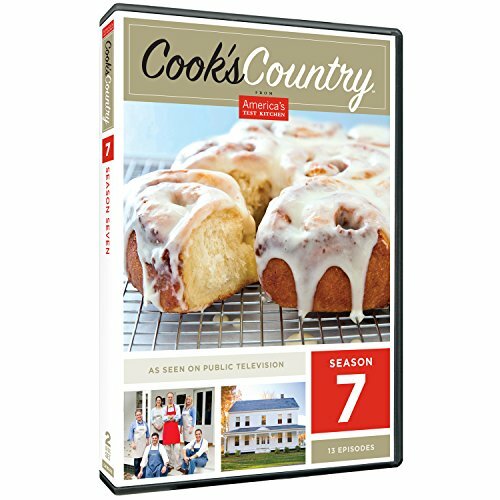 Fans of Cook's Country: Season 7 can also purchase seasons 1 - 6, which are all available on DVD from PBS Distribution.